Soak lentils in hot water for 15 minutes. Drain. Meanwhile, boil potatoes for 8-10 minutes or until soft when pierced with a fork. Drain. In a medium pot, heat avocado oil over medium-high heat. Add curry powder and salt and stir until bubbly. Add lentils to pot and fry briefly, stirring constantly. Add water and bring to a boil. Reduce heat to medium and simmer, uncovered, for 20 minutes until lentils are tender (add more water if necessary). Drain any excess water at the end. Cool slightly. In a large bowl, combine diced apples with lemon juice or vinegar to prevent browning. 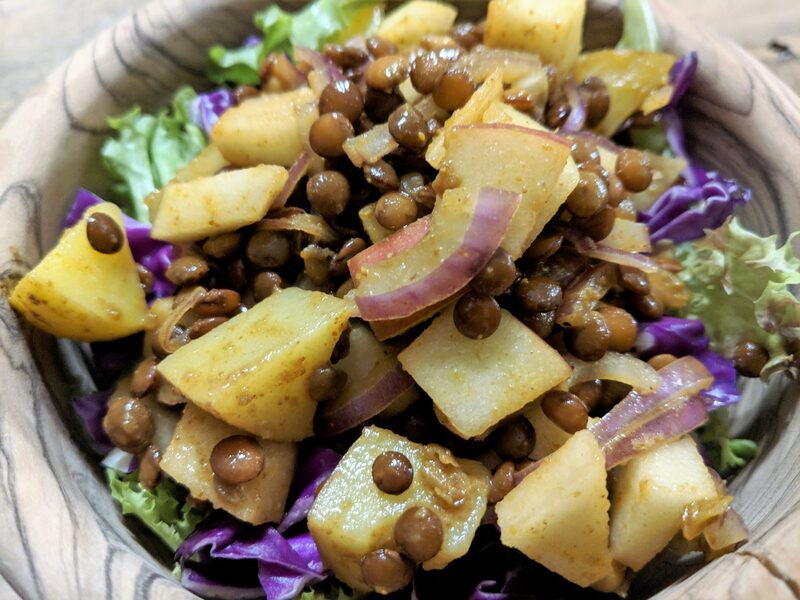 Mix in cooled lentils, along with cooked potatoes and sliced onions. Toss to combine and garnish with parsley, if desired. Serving suggestion: Serve lentil salad over fresh salad greens and shredded red cabbage. Enjoy!